During the summer Kodak was kind enough to lend me a Playsport to test out for a two-week camping trip. The Playsport is a light-weight, pocket-size HD video (and still) camera that is waterproof to 3 meters. The Playsport features a 5 megapixel sensor and shoots video at WVGA, 720p and 1080p through a fixed focus lens that works out to a 35mm equivalent of 36mm for stills, WVGA, and 720p and a 48mm equivalent for 1080p. It offers 30 frame per second on all video modes plus an additional 60fps mode at 720p. The lens is a fixed focal length, but it does offer a 4x digital zoom and electronic image stabilization. 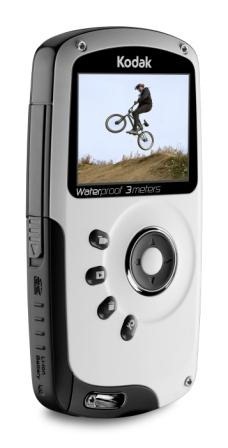 It has 128MB internal memory, but is primarily designed to shoot directly to a SD or SDHC card. And finally, it has a built in mono microphone and speaker for playback, USB 2.0, AV out, an HDMI connector, and accepts a standard 1/4” tripod mount. But enough of the technical specs. The PlaySport is the most fun video camera I’ve ever had the pleasure of using. I used it in the truck, in the trailer, in the pool, and it spent several hours in the ocean off of Cape Cod tethered to my wrist. Like all other cameras in the pocket video class, it’s easy to criticize the lack of optical zoom, fixed-focus lens, or the fact that the audio can get a bit strange sounding when the microphone is wet. But I kept coming back to, “It costs $160 and it’s waterproof.” I own an expensive video camera, and I wouldn’t take it to the beach for fear or getting a few grains of sand in the mechanism. But there I was, playing with the kids in the ocean surf and shooting video clips. I shot mostly at 720p to balance quality with file size, and I was pleased with the results. When it came to uploading a few clips to YouTube, it was also a breeze because the Playsport produces H.264 .MOV files that can be directly uploaded, no editing or re-encoding required. The bottom line: Two weeks with the Playsport changed the way I see personal video – from expensive and fragile to something really fun I could carry with me all the time. If you’re looking for an easy-to-use digital video camera that you can take anywhere, look no further. Highly recommended. This entry was posted in Cameras by Eric. Bookmark the permalink.